There's a saying...disasters come in threes. I used to scoff at that one. Until last night. Collin and I experienced our own little disaster trifecta. We've both been anxiously awaiting this movie--so much so that we bought our tickets online, in advance. As I wrote in a previous post, we'd purchased them for the earliest showing on Thursday evening, since Collin was off on Wednesdays and Thursdays. Then his days off were changed to Mondays and Tuesdays. He did manage to get Thursday off. Disaster averted. 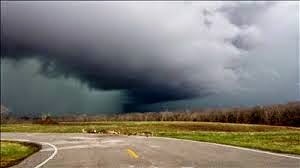 Yesterday, storms hit our area--all day long. I was starting to think we should go see Noah, to get some instruction on ark-building. We had an early dinner at TGI Fridays near Ronnies 20 Cine and went to the theater at 4:00, even though the movie was scheduled for 8:00. Lines tend to form early for Marvel movies, and we wanted to be as close to the front of the line as possible to get good seats. We were the only ones in line. The long lines came later, for the 11:30 showing. Those who did attend the 8:00 showing arrived much closer to that start time. While waiting, we discovered that an error had been made in the online ticket sale and our tickets were for the 3D showing. I hate 3D. Since I only have sight in one eye, 3D doesn't work for me. I get 2.5D...and a headache. Fortunately, theater management was happy to switch us to the 2D showing. Second disaster averted. Finally, the movie started. And stopped abruptly fifteen minutes later. We were informed that a tornado was confirmed on the ground nearby and the movie would resume once the all-clear was given. It's a good thing the theater has a phones-off policy during movies. I can imagine what a theater full of phones issuing emergency alerts would have sounded like. Finally, the movie resumed. Third disaster averted. Was the movie worth all the trouble? Absolutely. It's a darker film than I normally prefer, certainly darker than Captain America: The First Avenger, and it's more political thriller than superhero action movie. But it's still a Marvel movie. The characterization is impressive and the humor is still there. 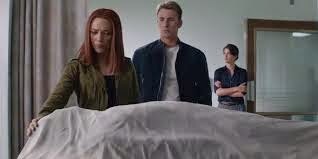 The relationship between Steve Rogers/Captain America (Chris Evans) and Natasha Romanoff/Black Widow (Scarlett Johansson) has grown in the two years since they first worked together as part of SHIELD's Avengers Initiative. 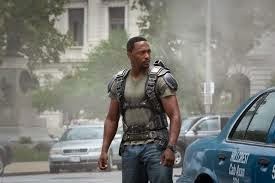 They're comfortable with each other, evidenced in the film's opening, when Romanoff finds Rogers and new friend Sam Wilson/Falcon (Anthony Mackie) on a Washington DC street and asks how to get to the Smithsonian. "I'm picking up a fossil," she says, a reference to Rogers' age (95, as he was born in 1918!). At first, Rogers is finding it difficult to trust SHIELD director Nick Fury (Samuel L. Jackson). Fury raised suspicions in The Avengers when Rogers, Tony Stark/Iron Man (Robert Downey Jr.) and Bruce Banner/Hulk (Mark Ruffalo) discovered Fury had neglected to tell them SHIELD was developing weapons of mass destruction. Now, Rogers finds that Romanoff has been ordered by Fury to take data from the hard drive aboard a ship on which SHIELD hostages were held. He confronts Fury...but soon finds Fury himself is targeted by other SHIELD operatives and is on the run. As Rogers, Romanoff and Wilson search for the truth, they find SHIELD has been taken over by an organization Rogers believed he'd neutralized back in 1944. A member of the World Council (Robert Redford)...a corrupt politician (Garry Shandling)...SHIELD operatives...their tentacles of power are everywhere. The trio no longer knows who can and can't be trusted. "How do we tell the good guys from the bad guys?" Wilson asks. "If they're shooting at us, they're bad," Rogers tells him. Then he discovers it's really not that simple. The enemy has a secret weapon. "He's called the Winter Soldier," Romanoff tells him, recalling her own encounter with the super-assassin, years ago, and the scars it left on her. He's a super soldier like Rogers, with a metal arm designed to do serious damage. The difference? When he's not needed, he's kept in cryostasis. No real life, nothing beyond carrying out the orders of his masters. 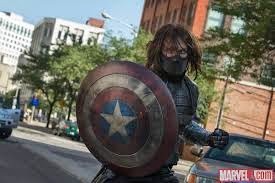 Rogers faces off with the Winter Soldier...and discovers the assassin is his best friend, James Buchanan "Bucky" Barnes (Sebastian Stan), the man Rogers has considered a brother since their youth in Brooklyn. Rogers recalls Barnes' role in the Howling Commandos, heroes of World War II, and his tragic fall into a ravine from a moving train while they were attempting to capture Dr. Arnim Zola (Toby Jones), a scientist working with Hydra, a Nazi-offshoot. He's stunned that Barnes is alive--but doesn't remember him or anything of his past life. Will the conspiracy be exposed before it's too late? Will Barnes regain his memory before he and Rogers find themselves in a fight to the death? Will Stan Lee make his usual cameo appearance? My recommendation: see the movie and find out! 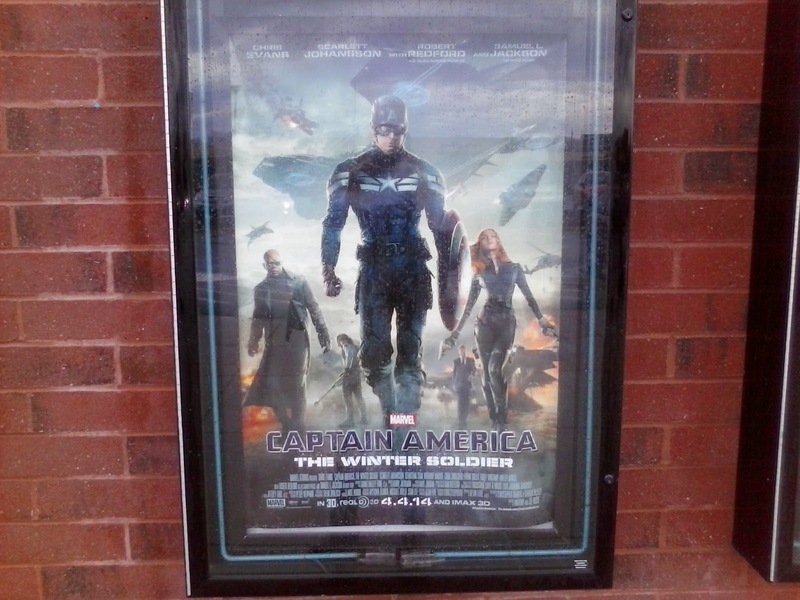 And be sure you check out the great review of this film by my partner in crime and Marvel expert, William, at his blog! Excellent, excellent review, Norma! And good that disaster's been averted! I saw it today. It transcends the superhero genre and is beyond that. I really enjoyed it. You are so good at reviews. People should be paying you to see movies. Great review. @ William: Hurry up and get your review posted! @ Carole: Get paid to go see movies? Now there's a dream job! This review makes me want to see the movie. Do I have to see the other movie first ? @ Gayle: You don't have to, but it's recommended. Both are excellent films! Wow, you really REALLY wanted to see this movie, didn't you? I think I would have given up at the first disaster! @ Cheryl: I'm stubborn! My dad used to say the fastest way to get me to do something is to try to stop me from doing it! OMG that's so weird Norma, but persistence won in the end.. it usually does I find :) So happy that you enjoyed it after all that, imagine! @ Grace: We did, indeed--but I found the day after, I needed a LOT of sleep! MIA...But For A Good Reason! "They're Creepy and They're Kooky...."
Snippet Sunday: No Room at the Inn?